With Commonland’s support, our partners in South Africa - Living Lands, Grounded, and Baviaanskloof Devco - have been working tirelessly with farmers, communities and local stakeholders to holistically restore the Port Elizabeth catchment area comprising of the Baviaanskloof and the Langkloof region, with the 4 returns framework. The area spans 500,000 hectares, and is comprised of private farms and communal land, as well as one of the largest wilderness area in South Africa. The challenge is to find a workable economic model that supports sustainable land management, for the benefit of the inhabitants of the area, whilst also improving water security downstream. In the Baviaanskloof, together with farmers in the area,we have set up the Baviaanskloof Devco; an essential oils processing company. The company provides an alternative for goat farming which has led to large scale degradation. 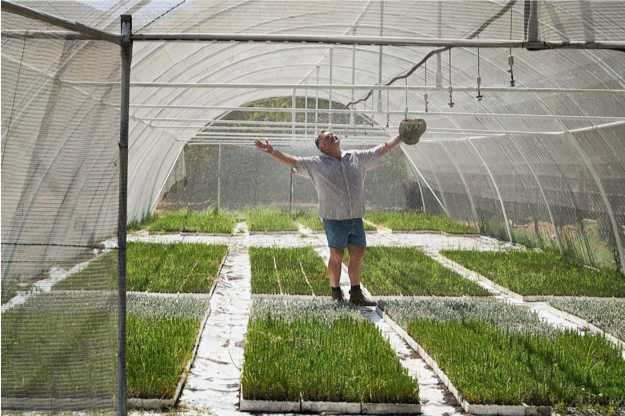 After the harvesting and processing of lavandin and rosemary crops in early 2017, other crops, of which some indigenous, were added for trials to diversify the company’s offering in the market: Cape Chamomile and Cape Gold, and Blue Yarrow. Simultaneously, our partners worked on active rehabilitation of degraded land. 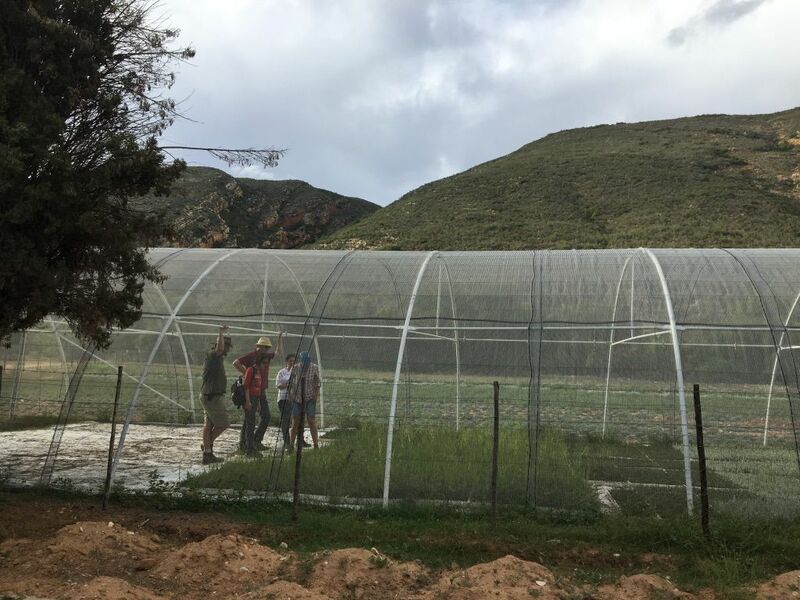 Overcoming many challenges and trialling new restoration techniques on the land, the Baviaanskloof has seen ecological returns met with strengthened community resilience. 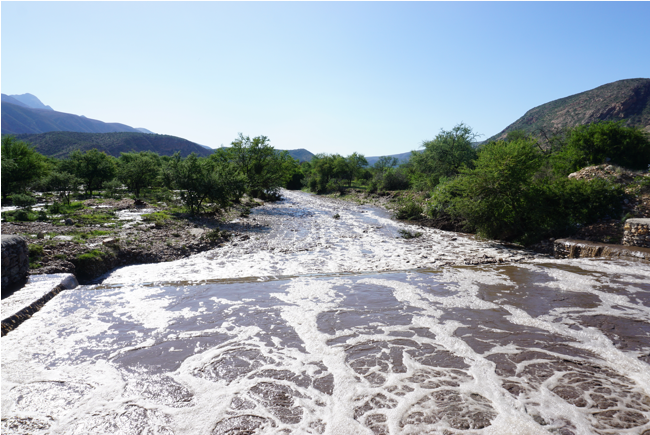 Having experienced close to 3 years of severe drought, our partners in South Africa were faced with the challenge to adapt and mitigate the effects of an erratic climate to protect and maximize the value of their landscape. Working towards restoring over 800 hectares of land in the Baviaanskloof, Living Lands undertook rehabilitating techniques to increase the landscape’s resilience. Living Lands bulldozed manmade “berms” (artificial shelves to manipulate natural water flows) and this ‘de-channeling’ allows the natural flow of the water to return. More than 40,000 “bunds” (semi-circular ponds) were constructed as an effort in water management, capable of capturing in excess of 5 million litres of water during a runoff in rain season. To prevent further “gully” erosion (deeply eroded landforms like ditches and valleys caused by running water) Living Lands created more than 1 km of silt traps. Tens of thousands of trees were planted to increase ground cover to protect the soil and hundreds of kilograms of seeds were sewn to increase biodiversity and crop productivity. Living Lands' collaborations and partnerships have brought together a wealth of multidisciplinary knowledge. National Government (Department of Environmental Affairs, Natural Resource Management) and regional agencies (Gamtoos Irrigation Board) have a vital role in building capacity for change. Our funders The Coca Cola Africa Foundation, the Global Environment Facility (GEF) and The Dutch Postcode Lottery have also enabled action on the ground. In December 2017, the Baviaanskloof reaped the rewards of the blood, sweat and tears given by our partners. For three months more rain fell, than the previous two years combined, onto the thirsty land and spectacular results fostered an almost forgotten sense of hope and inspiration. There are many challenges still to overcome but the team is determined to navigate its way through, and deliver 4 returns along the route. In the Langkloof, Living Lands and Grounded made significant progress with many farmers and harvesters towards setting up a landscape-wide honeybush company and association. Honeybush can make a healthy and delicious tea and in recent years it has become increasingly popular across the globe. Unfortunately, this had led to overharvesting and put many honeybush varieties under threat. Sustainable cultivation will take pressure off the wild stocks and support the natural rehabilitation of the area. The project aims to bring balance back to the Langkloof and increase natural biodiversity. Different cropping strategies are being trialled and a development phase is underway to establish the association with a group of interested farmers and harvesters, whilst the business strategy is being finalized. At the end of last year, Stichting DOEN committed to support Grounded to make the establishment of the Langkloof Honeybush Company and Association possible.